Volleyball blocking is defined as deflecting the ball coming from your opponent's attack hit. Blocking is a skill in volleyball used to prevent the opponent from a successful attack hit. A block technique is used to deflect the ball coming from an attacker. The blocker is trying to block the ball back into the opponents court. 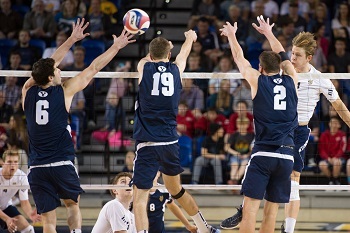 Advanced volleyball teams may have different blocking strategies. For example, one team may use a blocker to just take up space so that the defensive players can cover the rest of the court that the blocker isnt defending. Also, an advanced blocker may just try to deflect the ball to a teammate just to keep the ball in play. A block is a defensive playing action at the net. A block may be performed by one front row player or a combination of front row players jumping near the net in front of an opposing attacker. The goal is to block the spiked ball with the hands or arms preventing the spiker from a successful attack. A block assist is given when two or three players participate in a successful block at the same time. This is also known as a collective block. A double block is when two players are working in unison to deflect an attacked ball at the net. Its a good strategy to put up a double block as often as possible to help prevent successful attacking. A triple block is when three players jump up together at the net to block. A team putting up a triple block at the net is often difficult to do successfully. Since each team has 3 players at the net that could possibly get a set to attack, it can be difficult for blockers to get in correct position to put up a triple block because you don't know who is going to be set. The weak side blocker is the front player that blocks coming from the left side of the court. The middle blocker is the blocker that moves from the middle of the net to block. This player is often very quick and tall because they have the responsibility of defending against both the middle and outside hitters. The strong side blocker is the blocker that blocks coming from the right side of the court. Usually an opponents best hitter is hitting out of the strong side. Therefore, a team may decide to put their best blocker on the strong side to help defend the strong hitter. The offside blocker is the blocker at the net thats away from the opponent's attack. The offside blocker should pull off the net to help defend the attack or get in ready position to take an approach to hit. The responsibility of the assist blocker is to join the primary blocker to create an impenetrable block. This is called closing the block or sealing the block because the ball cant fit between the two individual blockers. A joust is when 2 opposing players contact the ball above the net at the same time. Play continues as if the contact was instantaneous. Penetrating the net is when a player reaches over the net during a block or an attack. Turning in is the act of an outside blocker turning his/her body to face the opponents court to ensure the blocked ball is deflected into the court. Getting stuffed is when a blocker blocks the ball straight down on to the floor just as hard as it was hit. Also, a stuff block is when a ball ricochets off the block into the attackers face or body. Stuff blocks are also called roofs. A player is often called a fish when they get stuck in the net. The net violation is also called tuna or flounder.